In our last post, Evan wrote a pretty fantastic write-up of how we used WordPress and D3 to create a custom gaming experience that kept site users and conference goers hungry for more. His piece shed light on the development side of gamification, so I thought I’d build out some more context for how gamification works for us within a macro product strategy, from the experience side of the team. I’ve also included far too many science puns in here, so bear with me. I just can’t help myself. 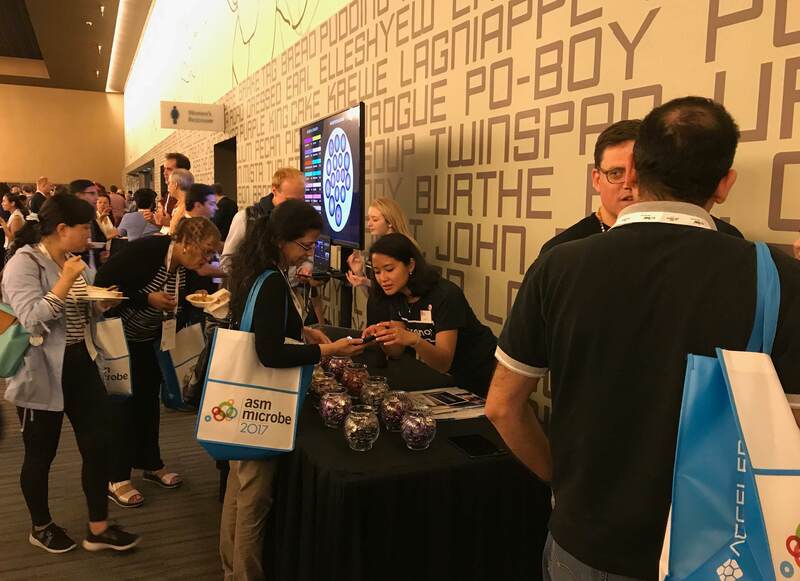 By now, you know about how we partnered with the American Society for Microbiology to create a platform for microbiologists to engage and consume the latest industry news, and how they asked us what to do about the looming site launch, given that it would coincide with Microbe 2017, the largest microbiology conference in the world. You probably also remember that MicroNow was designed to be a hub based on professional connections, and so it faced the same fate that new platforms always do: the critical need to build organic engagement at scale. We built this thing for people who love Microbiology to use as a resource and knowledge-share where they could truly geek out, and it’s the only platform of its kind. The ASM member network makes up thousands of scientists worldwide, so MicroNow would provide a much-needed destination for one of the largest areas of the life sciences. The problem is, regardless of how great the site potential, new sites don’t just instantly get a ton of captivated users when they launch; all that love that we pour into catalyzing sites can be quickly wasted without an ongoing strategy for marketing, content, and regular engagement, so we were pumped to be able to use the conference as the site’s launchpad to ensure its success. No matter how you splice it, we needed to hit a very precise goal. We had to come up with a way to engage users on-site and remotely, and we knew we needed to make it memorable enough to keep them coming back to MicroNow after the conference. And so we chose a strategic, all-encompassing approach to help ASM promote the site and grow a following: we built a game around it. You can use gamification as a means to envelop a bunch of micro-strategies into one cohesive product. That’s why we created a game that would bring the ASM team critical insights into how users were actually consuming MicroNow while helping conference goers feel less overwhelmed about attending the largest association conference in their field. To gamify the conference experience successfully, we’d need to be able to incubate a bit to contextualize the conference experience for attendees, so we went back to the lab to research conference way-finding experiences and the user pain points that develop during large trade shows. We found that trade show conference attendees are typically totally overwhelmed by the number of sessions available to them; for science-based conferences, the journeys students take throughout the conference is drastically different to that of a field expert or a career scientist. The more we extrapolated the data, the clearer it became that our biggest opportunity to maximize the conference would be through a collective participation-based experience. Write the narrative and rules around the game, to define our constraints and control the variables that would inform our user data. Since Evan already covered the first two steps, let’s dissect Step 3 of executing the game experience. Achievers play to win and are in it for the being at the top of the leaderboard. They’re motivated by clear goals. Explorers don’t care about winning; they’re driven by the discoverability and serendipity of the game, and they’re motivated by unexpected rewards peppered throughout their adventure. Killers are the few gamers who thrive on fierce competition and whose goal in playing is to not only win, but to eviscerate their competitors. *These specimens were of special interest to us as we faced the need for social brand evangelism. 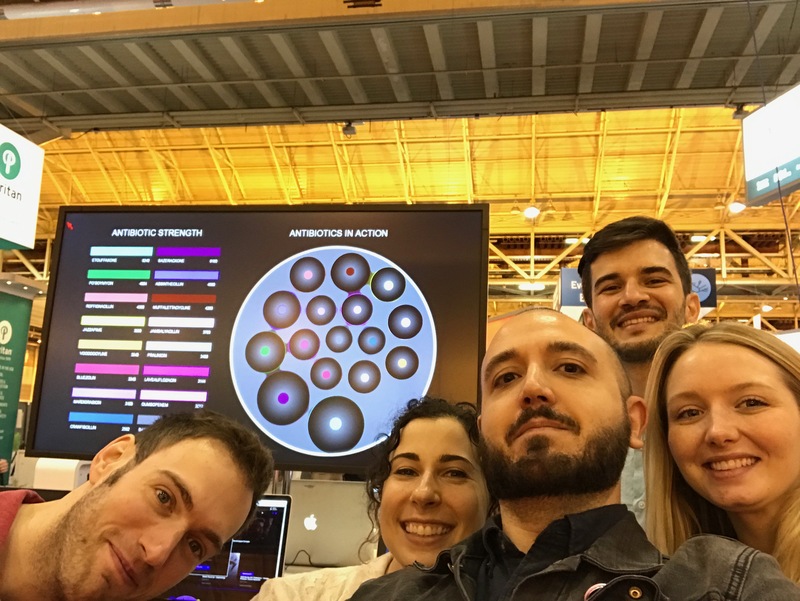 In New Orleans, while preparing for the Microbe 2017 conference, the ASM team discovered a new bacterial strain, and it would be up to the members of the MicroNow community, good scientists that they are, to develop the strongest antibiotic to contain the strain. 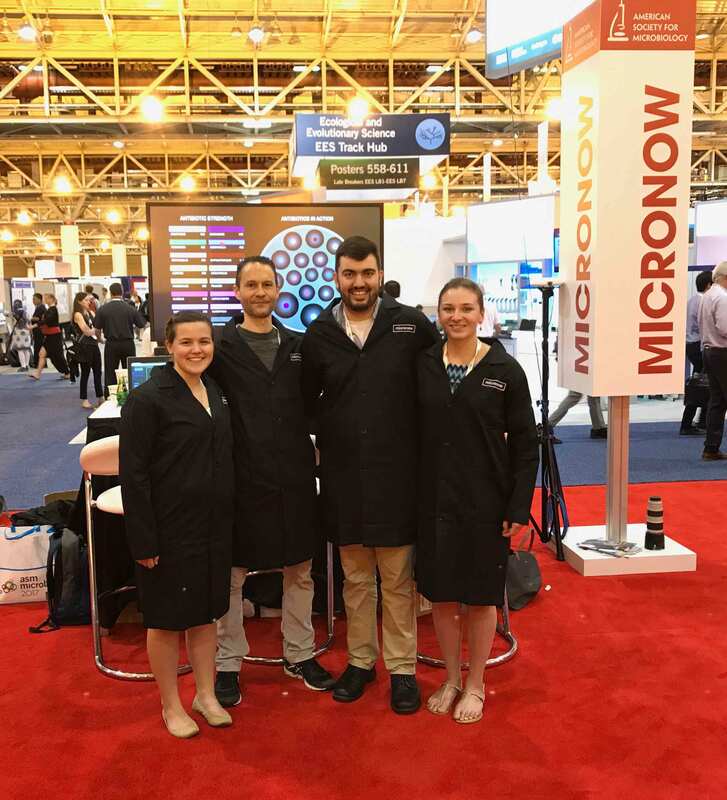 Upon registering for MicroNow, members would be colonized by teams developing an antibiotic. All these users had to do to gain points to strengthen their team’s antibiotic was use MicroNow throughout the conference to consume content, comment, and interact with other members. To make the game go viral and create a sense of urgency to empower its players, we borrowed from the drama and suspense of our favorite movie genre by providing realistic-sounding terminology for this fake bacterial strain and the fake antibiotics that counter it. If the story sounded real enough, we could hook in the Achievers and Killers, who would want to be the heroes and save the day, but since none of us here at nclud are microbiologists, we slightly worried that if we created a fictional microbe with scientific-sounding terminology, we’d go too far over that line and risk discrediting the integrity of the work that microbiologists do. So instead of creating the specimen names ourselves, we gave the ASM team a fill-in-the-blank story format, much like a Mad Lib, and we then collaborated on terminology that would sound realistic yet be obviously tongue-in-cheek enough to make it fun and fictional. After all, we didn’t want to incite panic at the conference with some realistic horror movie plot! We landed on a narrative that encompassed the appropriate microbial-sounding suffixes on words to make them feel real, with the tongue-in-cheek New Orleans-based prefixes to nod to the conference location: The bacterial strain nolacoccus beigneitis was discovered, and the antibiotic strains would include voodoocycline, po’boymycin, muffalettacycline and jambalayacillin. 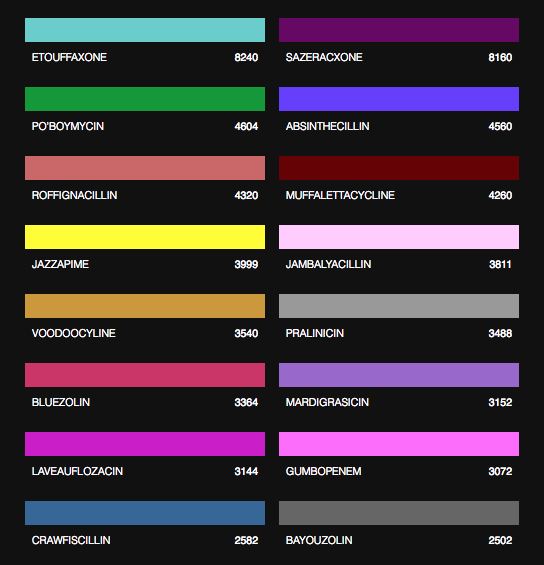 All the New Orleans-themed antibiotic names as seen on the leaderboard, with their corresponding strain in the petri dish. A closer look at those names. From there, we focused on designing a heterogeneous points system that would reward users enough to feel like the prizes were attainable, keeping them engaged throughout the conference, and ensuring that gameplay would align nicely with when the MicroNow team published new content. Should you use this methodology, we highly encourage you to determine the key game milestones before you create your point system, to keep things cohesive. In our case, users received points for registration, which served as a nice ‘gimme’ to incentivize users through on-boarding and keep them intrigued. They received 20, 40, 0r 80 points for site interactions based on level of engagement, so if someone thoughtfully crafted content and published it to the site, they’d be rewarded with 80 points, whereas commenting on an existing thread gave players 40 points. Before we get to the results, a quick word on swag, prizes, and the strategy for incentivizing game play across all user types: from our conference-focused research, we determined that due to the social, in-person nature of a science association conference, a physical prize would provide players with a greater return on their gaming investment than digital prizes, and so we gave them the creme de la science creme: winners got — wait for it — black MicroNow lab coats. The first four winners to claim their prize from team Etouffaxone. Now, for the swag. Swag is highly encouraged for this type of experience, to provide further feedback and to reward all user types. We gave team members color-coded MicroNow buttons for their conference badges, to help bridge the digital game with the physical conference experience and enable teammates to meet up and colonize in-person by classification. Socializers and Explorers were pumped to display their buttons, and Achievers and Killers were excited to be able to gauge their competition. (We also looked into providing larger pieces of swag to make team distribution more visually obvious at the conference, but ultimately decided to integrate more with the badge structure.) Visual indicators were a crucial tool to encourage teams to metastasize in person. The ASM program leads give out the team swag. These little tiny pieces of team swag had a stunning effect. Team members easily met each other and worked together to gain points. So many points, in fact, that traffic spiked on MiroNow at 4am — while most people were sound asleep — from one team’s push to gain points while their competitors slept. And it was almost enough for that team to win, but not quite. After some pretty intense battles for the last of the black lab coats at the end of the game, the insights we got from the game were unreal. We saw that users didn’t actually want to use the site for professional connections, they wanted to use it for its content, and through a few incremental upgrades to ASM’s content calendar, the ASM team could more efficiently maximize the user base and keep them hooked long-term. Players didn’t stop coming back to the site when the game ended, they shared the site with their networks globally, and, as if by mitosis, in the first month of MicroNow’s existence, its user base grew another 30%. Going forward, the ASM team can cell-ebrate (thank you!) and assess their site’s needs from this rich data set we gave them, crafting its experience according to its users’ needs. And for us at nclud, we’ll continue to track the site usability now that the game has concluded and it’s no longer under a microscope. Here we are (Evan, me, and our fearless Senior Project Manager Alfonso Bravo) with two of ASM’s fantastic program leads, Peter and Emma, after the announcement of the winners. 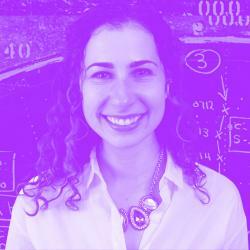 Chloe Negron is a Senior Experience Designer with a focus on unifying business and user goals through design systems. She practices human-centered design using design thinking. She also practices eating ice cream.